Rung on Mr Leafe's annual London outing. 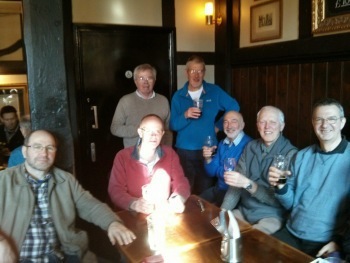 L-R Charles, John, Geoff, Ray, David, Philip, Simon. Jane is out of shot! Last updated Saturday, 7 March 2015 at 22:46:36. First submitted Saturday, 7 March 2015 at 12:46:35 by John Gwynne. This performance has been viewed 890 times.